Fear contributes to procrastination. The fear of failure, fear of making mistakes, etc. 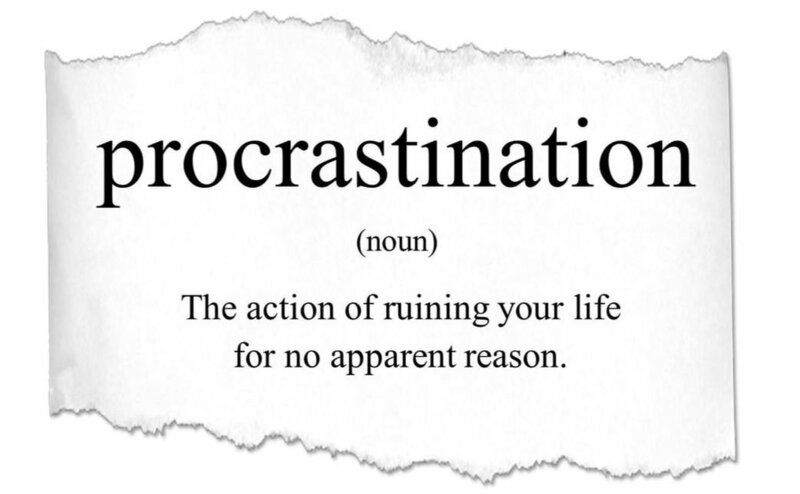 can lead to procrastination. To ensure that your fears don’t daunt you and delay the attainment of your goals, you should identify your fears and deal with them upfront. You should ideally start by making a to-do list of what you will like to accomplish. It is also recommended that you assign a deadline against each activity to be on schedule for completion of those tasks. When you start working on a new project or goal, the sheer size of it can overwhelm you. You can start putting it off and this will lead to delayed realization of projects and goals. An effective approach to work around such problems is to break down the projects and goals into manageable smaller tasks. When you do so you make the goals look achievable and are motivated towards working dedicatedly towards achieving it. You can also track your progress on achievement of these smaller tasks to ensure you are on track to realizing the overall goal on time. Distractions are one of the key reasons for procrastination and tasks getting delayed and not being achieved. You are surrounded by things like your cell phone, computer, internet, sporting events etc. which can be potential distractions. It is difficult to stay on your planned schedule when you are constantly being surrounded by distractions. You can set time periods when you stay away from distractions and use that time to focus completely on the task at hand. Working in such a manner will ensure that the distractions don’t result in procrastination and your work suffering. After completing a task, you should reward yourself for your efforts and good behavior. Tying an incentive to the completion of specific tasks keep you motivated for achieving your set tasks. You may pamper yourself by indulging into something you love. It may be small things like attending your favorite sporting event, playing a video game, enjoying a good meal etc.